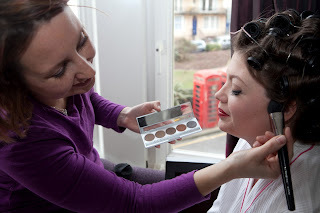 I have chosen to share with you hair and make up from last weeks wedding. When my bride turned up for her trial she told me that she never ever wore make up and definitely didn't do anything interesting or different with her hair. But it just so happened that my luck was in - She had visited a photographic studio to create some beautiful photos as a wedding gift to her husband to be. whilst at this photo shoot, the make up artist gave her quite a vintage look with thick black eyeliner and flicks and bright red lipstick. At her trial, after recreating the make up look that she desired we played around with her hair, looking at different styles to go with her make up and wedding dress.